I haven't done my experiment with the HI0659 knockout yet, because I'm waiting for the RA to pop in and get me the correct strain she made (it hadn't been frozen in the lab stocks). In the interim I've been poking around in the databases to see what I can find. HI0659 has a helix-turn-helix motif and not much else (it's only ~100 aa long). Hi 0660 is about the same length; it has a motif typical of Holliday junction resolvases. In our paper about the knockout mutants, our summary table says that no homologs of HI0659 have been found, and in the text we say that alleles of HI0660 in other H. influenzae strains often contain deletions and that homologs are missing from most Pasteurellaceae. I've now found good homologs of both HI0659 and HI0660 in Actinobacillus pleuropneumoniae, but nothing in any other Pasteurellaceae. 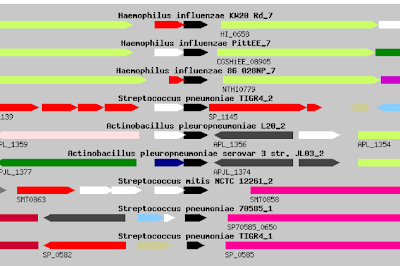 Homologs in other bacterial groups are rare - the only genus whose name I recognize is Streptococcus, where several species have homologs of both genes, but many don't. Here's the Genomes Region Comparison view from the JCVI Comprehensive Microbial Resource. I included quite a few other Pasteurellacean and Streptococcal species in the search, but only these gave homologs. A BLAST search with the HI0659 protein sequence turns up homologs in only the same species. 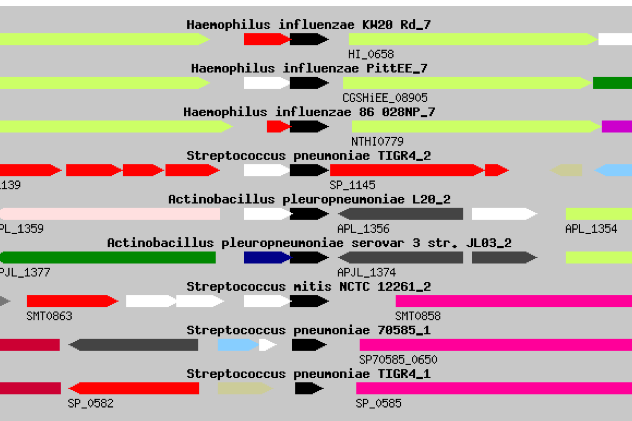 Some of these are annotated as members of an 'Xre-family toxin-antitoxin system' (I think HI0660 is homologous to the toxin component, and HI0659 to the antitoxin component). HI0660 is also tagged as a member of the Gp49 superfamily (also phage proteins I think). Xre family repressors are known to perform a variety of regulatory functions unrelated to toxin-antitoxin systems' (ref). The same paper suggests that the Tad toxin components might be mRNA-cleaving ribonucleases. Maybe that's what HI0660 does, and HI0659 is a repressor that prevents it from acting. If so, and if sxy mRNA was HI0660's target, then the mutant phenotypes would make sense. Maybe I should transform the HI0659::spc mutation into our lacZ reporter strains (sxy::lacZ, comA::lacZ and rec2::lacZ) and see if it affects their expression. I think I might have pooh-pooh'd this idea when the postdoc or RA suggested it a few months ago, but now maybe I see the light. We're going to do RNA-seq on the HI0659 mutant, but if its only job is to repress HI0660 we might miss this. But, if HI0660 is a mRNA-destroying RNase, we might see the loss of other mRNAs.